June 2, 2017, 7:35 AM · When news of the birth of Gustav Mahler’s niece was announced in 1906 in Vienna, there was much rejoicing among the musical royalty. Alma Rosé was born 25 years after her father, Arnold Rosé, and brother-in-law to Gustav Mahler, was appointed concertmaster of the Vienna Court Opera Orchestra and the Vienna Philharmonic. To be born into this family, in a city that personified elegance and sophistication, gave Alma a legacy that defined her very essence. Her life and martyr’s death was brought to the attention of Richard Newman, an award-winning journalist and music critic, by Alma’s brother, Professor Alfred Rose. A promising conductor in Austria before Hitler’s takeover in 1938, Alfred had been the protégé of Richard Strauss at the Vienna Opera. He did not want to talk about his sister for many years, until a chance encounter in an outdoor market. A stranger heard Alma’s name, and she told him that his sister had saved the lives of many Jewish girls. She was a violinist with great technique and flair, and a musicality grounded in the great Viennese tradition imparted to her by her father and uncle. In the 1930’s she founded and led the brilliant women’s orchestra, the Wiener Walzermadelyn, the Viennese Waltzing Girls, that performed in Munich in 1933, only a few weeks after Adolf Hitler had risen to power in Berlin and declared the birth of the Third Reich. In the years of depression between the world wars, Alma succeeded in bringing employment to many women. This ability would rise to another level when she used her musical and personal skills to survive in the death camp, walking the tight rope between the musicians and the Gestapo. That Alma would be a musician was pre-ordained. No one could predict, however, how her destiny would unfold. No amount of talent can fully prepare a person for the difficulties inherent in the music profession. 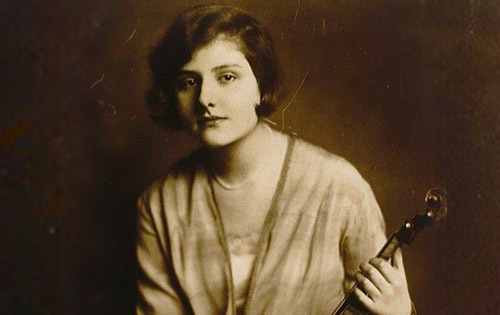 To be a Jew in Austria after Hitler annexed it in 1938 didn’t stop Alma from her determination to work as a violinist. She dealt with, as best she could, the circumstances that might ordinarily paralyze a lesser and more ordinary musician. The obstacles she would face, both in her personal and professional life, reached a feverish pitch as the noose around the European Jews tightened. After accompanying her father to London, where he would be safe from the deadly risk Jews faced in Europe, she moved by herself to Holland from Britain in 1939. She knew full well the dangers that Hitler had inflicted on musicians and other Jewish professionals throughout Germany and Austria. One of the reasons she and her father had left Vienna was because there was no work for them. Some Jews could see that it was not safe for them anywhere on the continent, and had the means to leave while it was still possible. However, for the vast majority, it was next to impossible to leave, with economic factors and limits on immigration imposed on them. Many had hope that such nightmarish living conditions would eventually be reversed. Alma’s story has been told by several authors, and an even-handed, empathetic history is told in Alma Rosé – Vienna to Auschwitz, by Richard Newman with Karen Kirtley, (2000), Amadeus Press. This is the tragic account of a multi-talented musician whose energy and rich heritage became enmeshed in the crushing massacre of European Jews. Those who were not killed each had a unique, spiritual story of survival. To play the violin and conduct, while helping her fellow musicians survive, gives us a sense of her deep artistic convictions. Such a story always has many sides, and Alma was cast in a poor light in the movie Playing for Time, starring Jane Alexander as Alma and Vanessa Redgrave as the singer Fania Fènelon. Unlike the book by Newman, it gives no background about the principal characters. It is the version of the story from the book by Fènelon, and it glosses over the death of Alma eight months before the liberation of Auschwitz. Every surviving musician felt the movie desecrated the life of Alma. The story of Alma’s death is still a mystery, Some believe that it was a result of food poisoning, while others think she was murdered in a plot of revenge by the Nazi SS officers. Alma’s spirit is a story of the ages, and violinists cannot help but be caught up in her fight for survival. She was the personification of high musical ideals, with the brilliant mind of someone who allowed herself no other choice but to survive. Long before the war, Alma’s marriage to the popular Czech violin virtuoso Váša Príhoda brought together two high-spirited musicians, but made her vulnerable to the extreme heartache of being cast in his shadow. Her sense of isolation and loneliness plagued her throughout her life, however much her musical talent gave her life meaning. She had a strong and vivacious personality and was a fine virtuoso in her own right. Her fate during the war was to be a witness to the catastrophe that befell Europe’s Jews, and as a player who used her music and her leadership to save many Jews at Auschwitz. At the beginning of the war, she spent several years in Holland living with a Christian family, all the time fearing that if she were discovered by the Nazis, they and their baby could be taken away. She did not leave in 1940 when many others left, but in 1942, she made plans to escape. Others urged her to go into hiding like Anne Frank, but Alma’s personality prevented her from confining herself in compact quarters with unpredictable strangers whom she would share a residence with. Alma had an adaptable musical mind and a survival instinct that would be tested when the Jews had nowhere to turn. June 5, 2017 at 10:09 PM · The Nazis did not know good from bad. Their minds were poisoned, as are the minds of many in the U.S. today. My friend has a violin that was 'rescued' from one of the camps, and I enjoy playing my flute in duets and quartets with him. June 7, 2017 at 07:01 AM · What's going on in the US now is .... only a little bit crazy. What happened in Germany/Austria didn't seem that crazy at first; it's been pointed out that Hitler didn't go to full-on concentration camps right away, and that, at the time, it seemed anyone who had an idea of what was coming was being alarmist or easily startled. June 8, 2017 at 04:43 AM · This book has an added meaning for me because my mother was a survivor of Auschwitz. She wasn't a musician but she had a beautiful voice, singing Yiddish songs with just the right tempos and nuances. There was so much feeling in each phrase. She very likely saw Alma and her musicians in the camp. The book told me what actually happened to the prisoners, or at least a sliver of the truth. No one will ever know, and certainly children of survivors were shielded from the truth by their parents. The author did an amazing job of bringing to life the story of one woman's survival inside of a musical setting, within a nightmare. How quickly a democracy such as Germany descended into this barbarism parallels the fear many in the U.S. feel today. All it takes is one moment of national irresponsibility and panic to set itself into a downward spiral.